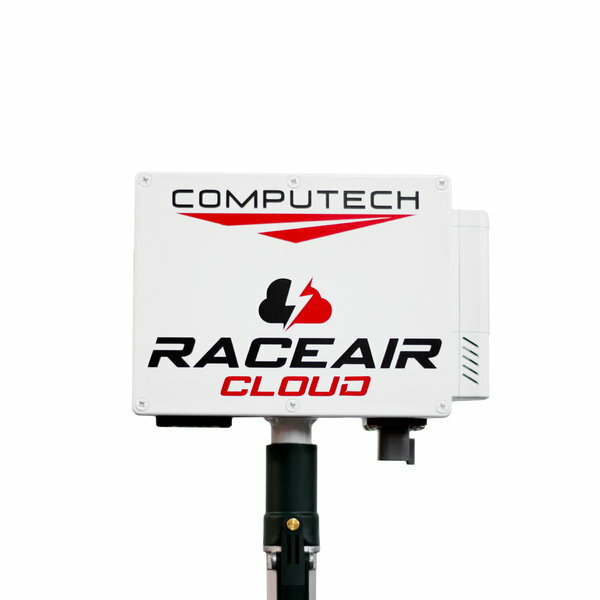 The RaceAir Cloud Racing Weather Station is the most accurate and comprehensive trailer weather station on the market. We give you every weather variable you need including sunlight intensity and can deliver it to you through text message or your own pager. The new RaceAir Cloud racing weather station has been re-designed to include wind speed, wind direction, sunlight intensity meter, text messaging, improved paging distance, new improved software, and comprehensive easy installation and storage. Weather Variables: Temperature, Humidity, Pressure, Wind Speed, Wind Direction, Sunlight, Performance Altitude, Standard Correction, Density Altitude, Air Density Ratio, SAE Correction, Humidity Grains, Dew Point, Vapor Pressure, Wet Bulb, Pressure Altitude. Features: New Easy To Use Software, Text Messaging (requires internet), Paging Capability (optional), Quick and Easy Pole Mounted Installation, Safe Trailer Storage Mount, 40′ of Extension Cable, Windows and Mac Compatible. When it comes to racing weather stations, there is only one name that the pro’s trust, the Computech RaceAir Cloud.